How to implement "Lean Thinking" in a Business: "Lean Thinking" in NASCAR- if you look close enough it's everywhere you GO !! "Lean Thinking" in NASCAR- if you look close enough it's everywhere you GO !! 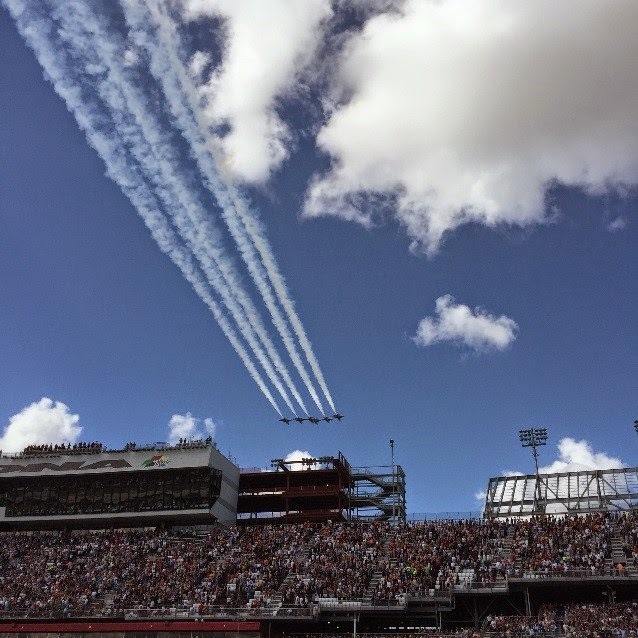 So Ernie and I attended the 2015 Daytona 500 this year with a little different lens than usual. 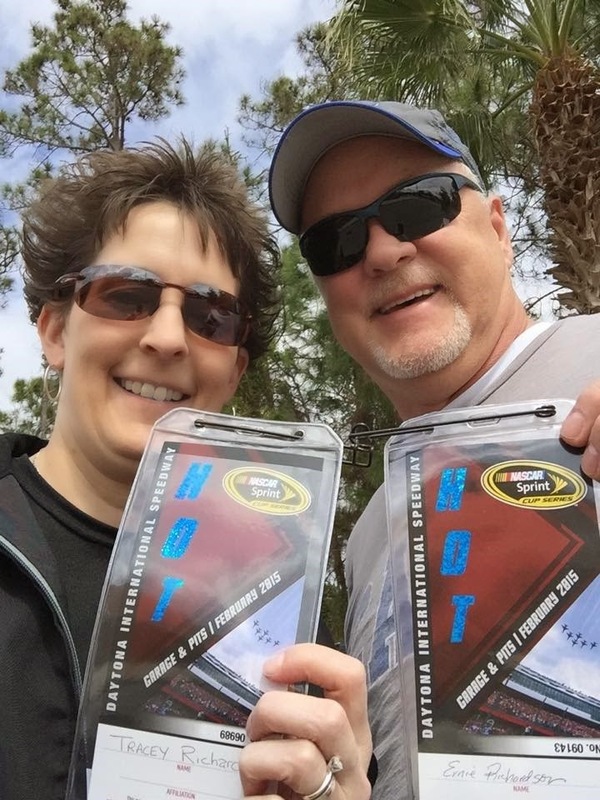 We were fortunate to receive “hot pit” passes which gave us access to the garages, and pits during actual live racing. We were able to get up close and personal with every aspect of the race from behind the scenes. So of course we were doing what we are conditioned to do – look for examples of lean and how each team uses the tools to be more effective and efficient. It literally comes down to seconds, preparation, execution, continuous improvement and a little luck to cross the line in front. 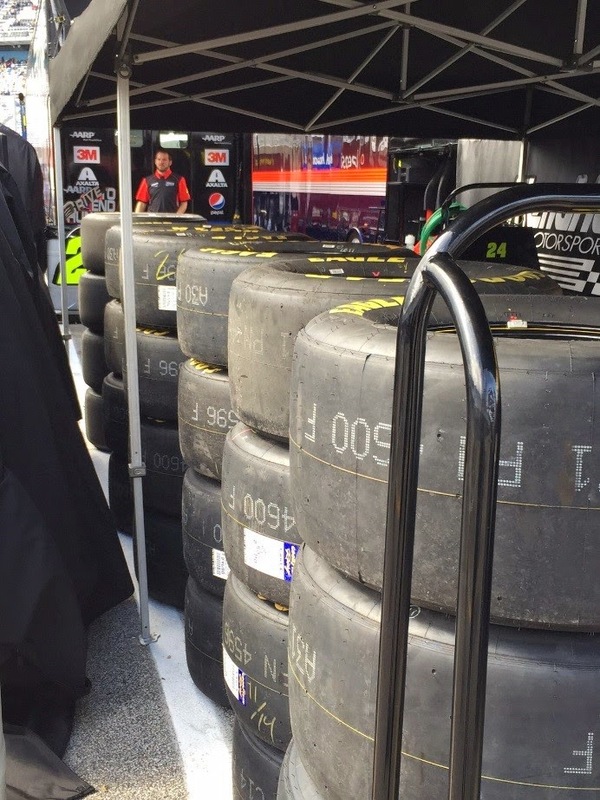 As we were walking through NASCAR team trailer area, we noticed various 5S examples of how the Goodyear racing tires were being mounted and staged before the race for each team to pull from based on certain track conditions and even unforeseen events during the race. We noticed how visual management was being incorporated by the pit crew in order to differentiate the rear from the front tires (different tape color being applied) and how to align the lug pattern on to the studs in the quickest way possible during the tire changes. 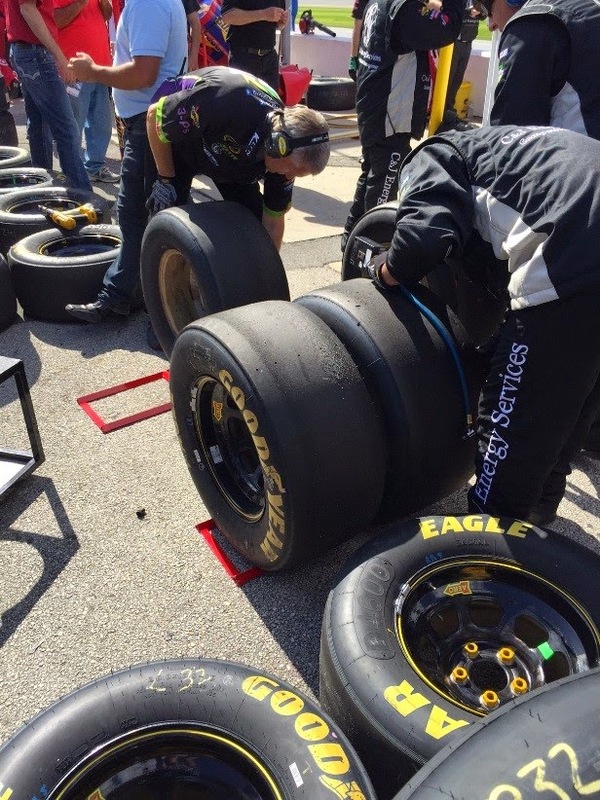 If you notice the yellow lug-nuts are actually glued to the rim to save time by the tire change pit member. An ideal pit stop time is around 12 seconds or less to be competitive. These visual controls are crucial for standardized work. As we continued to walk down the pits we observed more examples of visual controls, problem solving and data collection which allows the teams to understand the relationship of tread wear and proper air pressure. The relationship of these are necessary in order to meet track conditions before and during the race. 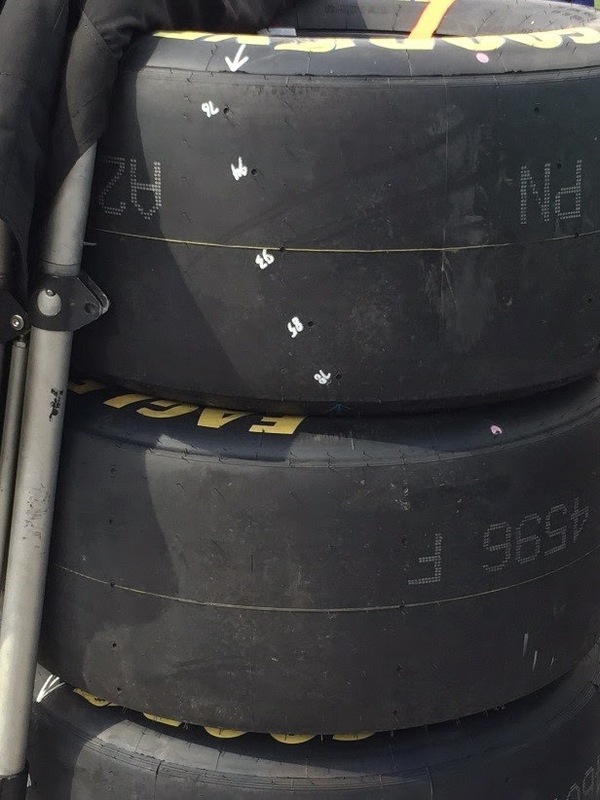 If you notice the various numbers that are visually displayed on the outside tire tread its telling the pit crew what the specific tread depth is on various areas of the tire in order to grasp the situation before its placed on the race car. 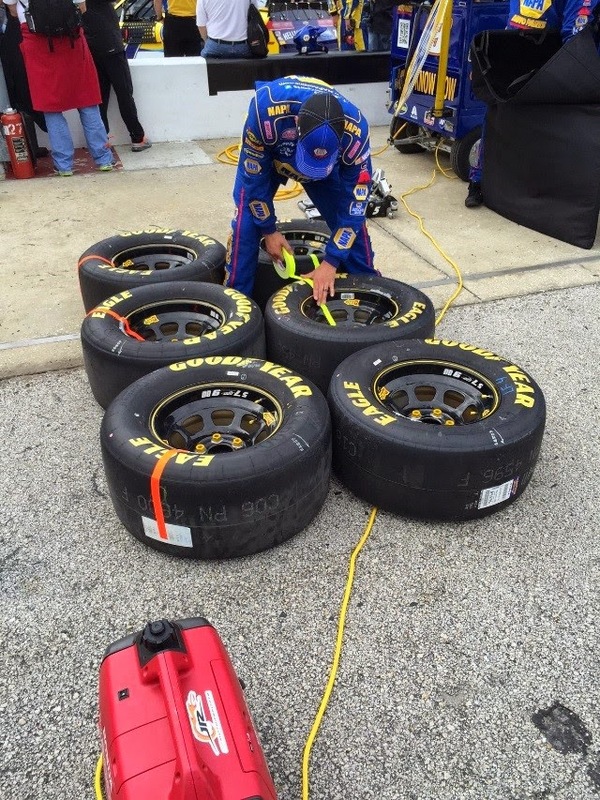 If you notice in the 2nd picture these tires had been removed from the car at one of the pit stops and immediately were measure by depth and pressure to understand how the tire is performing under the current track conditions and allows them to adjust the next set if necessary. You could consider this a leading key performance type indicator that is predictive to future tire wear and the handling capabilities for the car/team. PDCA throughout the race. As we were visiting various pit areas we noticed the use of a Kanban and pull system with the gas replenishing process. 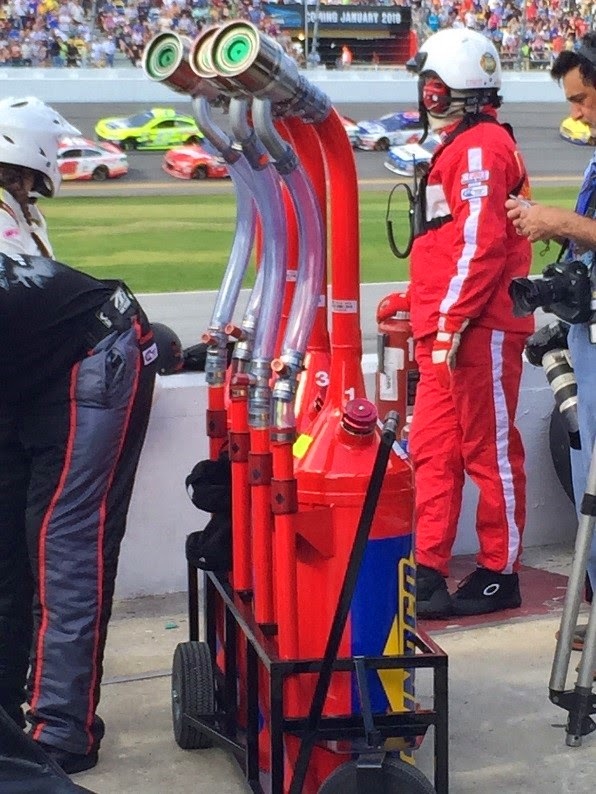 They come to the pit area in a Kanban of 4, then placed next to the pit wall for quick access and usage by the fuel replenishing pit member often called the “gas man”. When these two are emptied it creates an open spot giving direction to the pit support crew to fill both slots for the next pit stop. When all 4 are used the support crew refills the cart to restart the process. It’s practicing just in time. Another data collection point in the gas refill process is weighing the gas can before and after the pit stop to determine exactly how much gas went in and how much the race car is consuming during the race to understand when the next pit stop is necessary and to determine fuel mileage for the team. 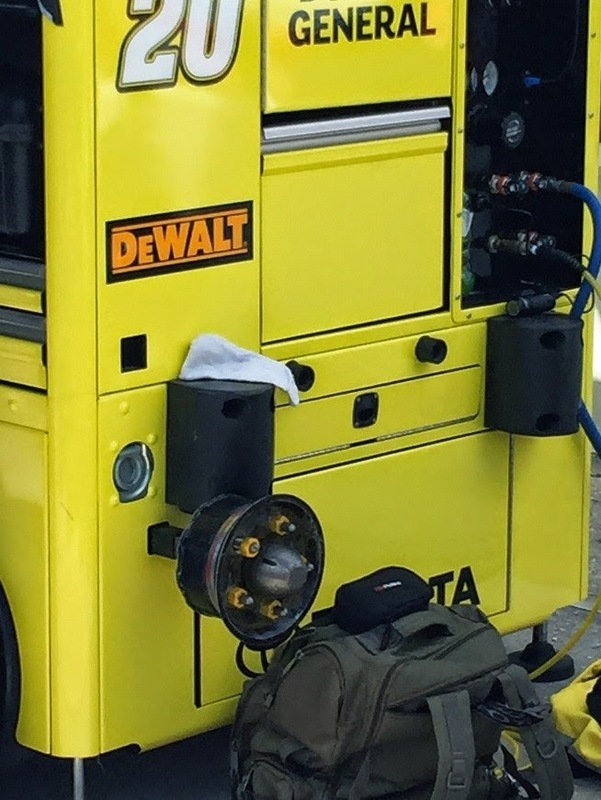 Lastly, on our tour of pit row we noticed a wheel hub mounted on the side of a pit box for the tire changer to actually practice their standardize work of placing the lug nuts on and off in a specific pattern in order to master the timing and body placement during a pit stop tire change. 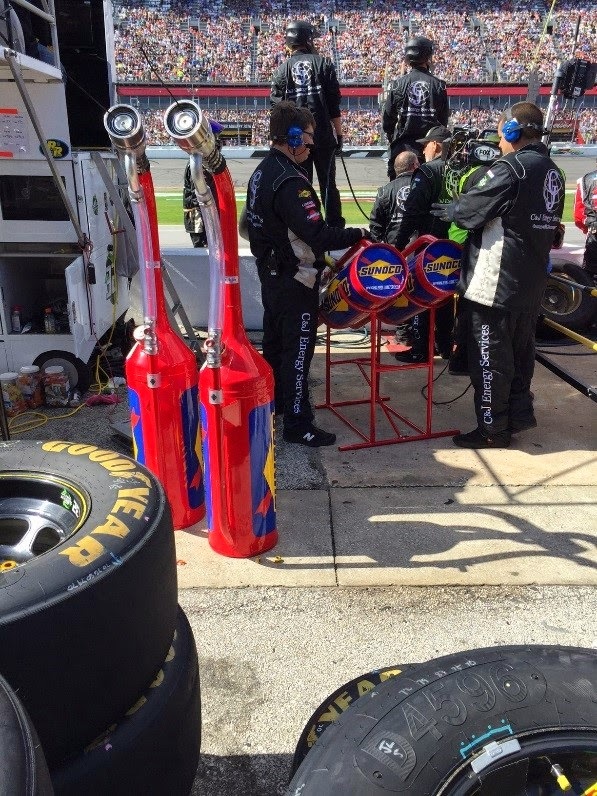 Tire changers are one of the essential parts of a pit stop, it can often make or break a team in how they come out and are placed after a caution or green flag pit stops. It was very enlightening to get this special opportunity to see the things we teach in our sessions used so well with discipline and accountability for standard work with each of these teams. We learned lean is everywhere if you just take the time to look for it. NASCAR is a prime example of holding each member accountable for their actions and to always be looking for ways to continuously improving their processes. Unlike most companies there are many more “leading” type key performance indicators allowing them to be predictive of their outcome, versus lagging and after the fact. The next time you get to watch a race look for the lean tools in action they are there! Keep the lean movement going—Green flag thinking!! !